For audi 80 b4 s2 rs2 convertible coupe-scheinwerfer hella 1al007140-081 right. This product page has been automatically translated. If you have any questions, do not hesitate to contact us. For audi 80 b4 s2 rs2 cabriolet cut off lights hella 1al007140-081 right. 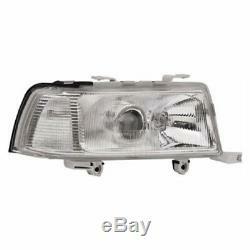 For all models audi 80 1991 1995 and coupe daudi and cabriolet of 1993 with spoons in the bumper. Without servomotor - existing can be applied. Bulbs all on the right / passenger side. Oe / doem numbers: (just for comparison). Auto parts online - top quality and quality service at low prices! See the instructions for the offer. Shipped your order with payment until 14:00 on weekdays usually the same day. We ship with DHL and GLS. Tracking the delivery of your goods extension is possible online. In the camp of heiligenhaus mo. At the end of the possible clock 8-16. Delivery address and billing address. Please check your order on the current data. Incomplete or improperly registered contact information can lead to delays and even failure. You have the payment options with us following. O Advance payment by bank transfer o cash on pick-up. When shipping abroad: possible only against payment in advance! No sending in cash on delivery. Shipping in European countries: only by prepayment! O 30 day return guarantee. Conditions of withdrawal, please refer to the information of our customers. 98% of our products sold rejected! If there should be a reason for complaint however times, our support and return management service team is there for you. Please report always returns there to return with us by email to. Therefore can not be guaranteed here, that sinscrit the article offered in each vehicles listed. Please, always make sure that the complete manufacturer's number / compare the spare part number oe as well as the photo. State of the item: Please note the instructions in the article description of the current state of the article. We offer new goods, b-stock, special items goods and used parts for sale. You receive partial when we b-ware, new special items items and used parts at special low prices in a good working order, but without original packaging. Note: the products we offer are basically not original parts, unless they are marked as such a rücklich usd. Photos and oe numbers are for comparison purposes only. All brands used are the property of their owners. Shipping to countries outside the EU. Customs charges are the responsibility of the buyer. Please keep in mind that there may be liefeverzögerungen due to their customs clearance. Please note that for countries outside the European Union: due to customs duties may result from a change in price. So customs clearance can cause a delay in delivery. We provide on this European territory no. Please note the following delivery exclusions. Postal code areas are included in the delivery: 97133, 97150, 972xx, 973xx, 974xx, 971xx, 97500, 976xx, 986xx, 987xx, 98799, 988xx (guadeloupe, saint-barth, saint-martin, martinique, french guiana, Meeting, Saint Pierre and Miquelon, Mayotte, Wallis and Futuna, French Polynesia, Isle of Clipperton, New Caledonia). We do not deliver in regions with ZIP codes: 97133, 97150, 972xx, 973xx, 974xx, 971xx, 97500, 976xx, 986xx, 987xx, 98799, 988xx (saint-barthelemy, saint-martin, martinique, Guadeloupe, French Guiana, Meeting Saint-Pierre and Miquelon, Mayotte, Wallis and Futuna, French Polynesia, Audio Island Clipper, New Caledonia). Postal code areas are included in the delivery: in the (Isle of Man), gg (guernsey), I (jersey). We do not ship for the following postal codes: in the (Isle of Man), gg (guernsey), I (jersey). Postal code areas are included in the delivery: 23030, 22060 (livigno, champione 'd italia), 47890 47899 (san marino). The seguenti area of ​​the postal code consegna sono exlus dalla: 23030, 22060 (livigno, champione d 'italia), 47890 47899 (san marino). Quedan excluidas of the entrega: islas baleares mallorca. Bearing the unknown name - / - 60100. The item "für audi 80 b4 s2 rs2 cabriolet coupe de-scheinwerfer hella 1al007140-081 right" is for sale since Thursday, February 15, 2018.